It's Insta-Friday again and time to share simple photos from the past week. 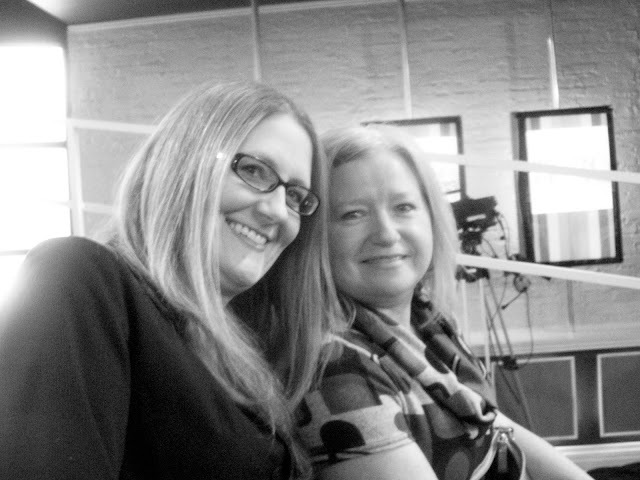 The highlight of my week was when my friend Jackie and I attended a taping of the "Steven and Chris" show. Chris from DK Canada invited me to be in the studio audience while they presented DK's Smithsonian Fashion book. There was lots of clapping involved, I'll tell you. And my cheek muscles hurt by the end from all the forced enthusiasm, but it was a lot of fun nevertheless, especially with Jackie grumbling by my side. (She was hungry and tired of being instructed to perform like a trained seal.) We couldn't actually see Steven and Chris with the cameras in the way. Poor Jackie. In between segments they would entertain the audience with opportunities to win prizes. I won a prize just because they called out my seat number. (A book from that horrible guy on Dragons' Den and a nice jar of body scrub.) When they called out Jackie's number, they had a special treat in store for her. They called her to the front and stuck a picture of disaster-prone Toronto Mayor Rob Ford on her head. I don't even like playing Hedbanz with my family, never mind in front of a studio audience. She had to ask yes or no questions to figure out who it was. All I could think was "I'm glad that's not me right now." Sorry Jackie. Anyway, she won a foam roller in the end. Now she gets to exercise. Yay. Afterwards, we ate lunch in the lobby. 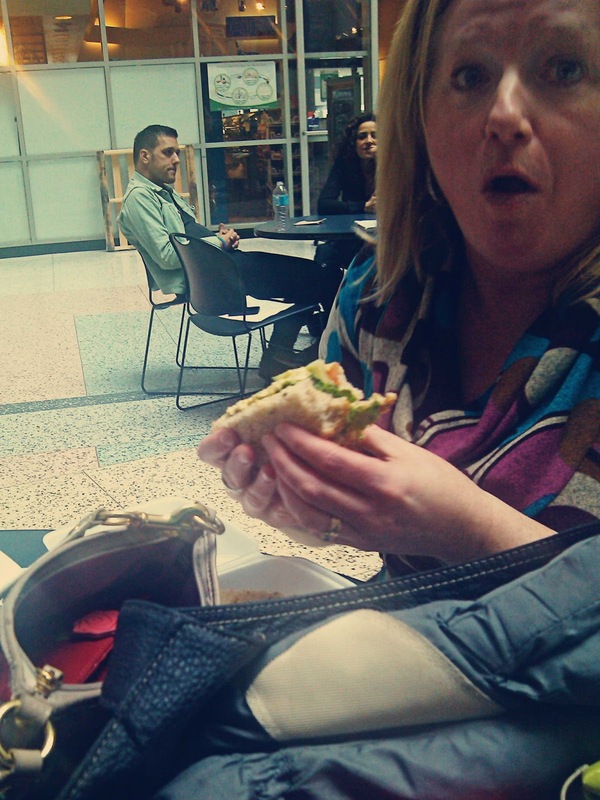 Strombo was at the next table, but Jackie didn't care. 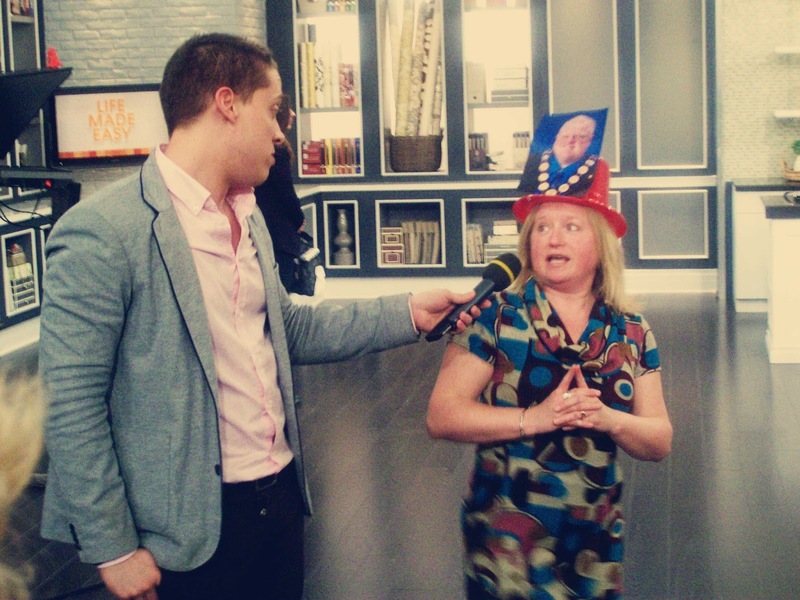 She was so hungry she could have eaten Strombo. "Steven and Chris" airs on CBC weekdays at 2 p.m. You can also see the show in the U.S. on ABC's LiveWell Network. Look for Jackie and me on March 20th, in the second row, on the far right, smiles pasted on our faces. Well what a sort of fun outing you two had. Sorry that the taping involved a lot of forced smiles and no view of the hosts...but at least there is the hope of seeing yourselves on TV. haha, the way you wrote this post had me laughing! Lucky you for going to a taping of the Steven and Chris show. I was part of the live audience for the taping of a Rick Mercer episode at the CBC studios and although the show is not my favourite, I found the whole experience to be quite fun. We had some good laughs. I laughed more when I posted the photos. Rick Mercer would be fun too! This made my morning, thanks! Poor Jackie, that's the stuff of nightmares for me! I'm glad you enjoyed it. :) I know...oh my gosh...that is a nightmare for me too. I hate to be centred out! Sounds like something that would happen to me! I feel her pain--picked on after having to perform like a seal while being hungry. Sigh... Visiting from Life Rearranged. I love Steven and Chris and have been in the audience once! It was so much fun, but when I watched the airing a few days later I saw myself in the audience and was horrified at the stupid face I was making lol oops Glad you had good time!! I am so afraid I'll be making a stupid face too Natalie! i love the sandwich pic and caption LOL And there's still time to enter my I ♥ Makeup giveaway! Looks like you girls still had fun. I think the last time I was an audience member was 20 years ago in Los Angeles for a taping of Love Connection. It was alot of fun! That's classic...Love Connection...that would be a fun one to see! I didn't even realize the show was shown in the US until we got there. I guess it's a new thing. Well, at least you have fun memories, right? Sounds like a fun adventure...your poor friend, though. At least she'll have stories to tell! I'll have to see if I get the LiveWell network. I know...poor girl. I am curious about this LiveWell network. There are so many now, I can't keep track.